Well, since Penguin Group (to which my imprint, Riverhead, belongs) has now made the cover jacket public, I figure I can, too. At this (quite advanced) stage in the book-publishing process, there is suddenly a lot to do, always urgently and usually without prior notice. For instance, another dead-tree copy of the manuscript just landed on my desk, marked up in old-fashioned ink. Apparently, the cold reader had had his go. The cold reader? Who knew? I normally prefer my readers warm. It appears that Riverhead has sent the manuscript to someone who is anonymous to me (“cold”, I suppose) for perusal. His or her comments were not “large” (about the sweep of the story, or the logic of an argument, say), but very detailed queries about language. All regular readers of The Hannibal Blog know me as a pedant (or word-lover, to be generous). I am rarely caught out in word matters. But it does happen, and I find that fun. So here are a few things the cold reader pointed out, and then a few instances in which I overruled him/her. If something “ascends up to,” it actually simply “ascends to”. A “crevice” is not a “crevasse”, and Hannibal in the Alps better have passed the latter, or we would be mighty bored. A line of soldiers marching “only a couple of men deep” is actually marching “a couple of men wide.” Duh. If Scipio and Cato (or whoever) “mixed like oil and water”, then they did not mix, like oil and water. 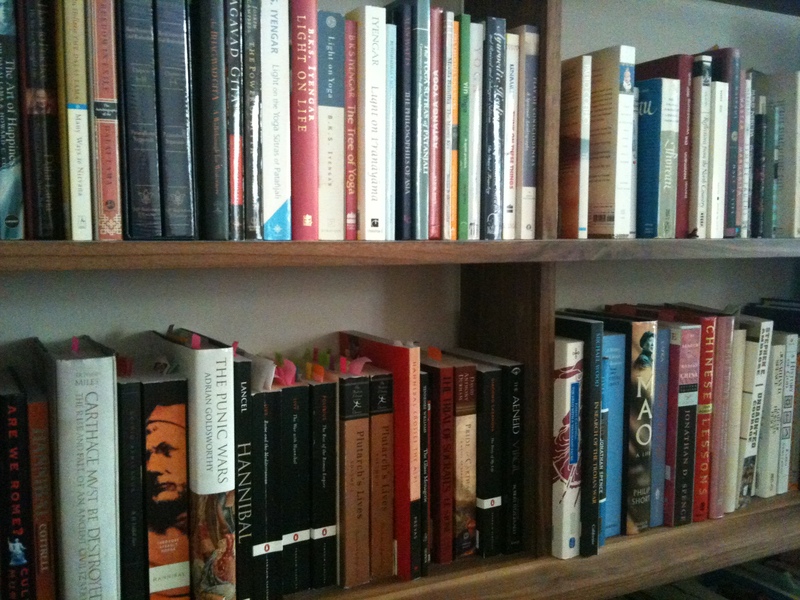 Do I really need to spend hours going through my books to find out whether Lucius was Scipio’s only brother? Oh yes, because, that determines whether it is “his brother Lucius” or “his brother, Lucius”. No, Meriwether Lewis’s father was not fighting “Native American” tribes. He was fighting “Indian” tribes. It’s about context. Hannibal might have contemplated a “bold evacuation of Italy.” But he could not have contemplated a “bold evacuation of his troops from Italy.” Why would he want to rip out the innards of his own soldiers? By the way, it turns out that the fourth draft of my manuscript, which I sent off to my editor at Riverhead in May, was indeed the last and final draft. In other words, the manuscript (ie, book) is officially finished. It is written. Done. I chatted with my editor the other day, and he loved it. Thinks it’s a winner. All that. In particular, you may recall that the only major and noteworthy change in the final draft was a new final chapter. A chapter of “lessons”. My editor likes that chapter exactly as is, without any iteration. I got my book deal with Riverhead in December 2007, a bit over 2½ years ago. About one year later, I delivered the first draft. So that was 1½ years ago. Just over 2 years after the deal, I sent my final draft. So I guess it took two years to write the book. But for much of the time between drafts, I was really just waiting for my editor to get back to me. So it actually only took about 1½ years of work. And always part time, (after the kids went to bed, on weekends etc.). No big deal. Consider that, if you’re thinking about writing a book. The surprise, therefore, is not how long it took me (not long) or how hard it was (not hard) but how incredibly, mind-numbingly slow the publishing industry is. The next step, I have been told, is now for the publishers of Riverhead (ie, the boss) to set a publication date. You might think, as I once thought, that they simply start printing and there we are. Oh no. Various mysterious processes now begin, and they take half a year or so. Furthermore, the scheduling of a book release is apparently both science and art, so tactics come into it. You may not want to release in the fall, when celebrity authors come out; you may want to release just after Christmas when reviewers and connoisseurs apparently look for new talent; and so forth. So now I am, as I have been, waiting. Just waiting. Oh, and we haven’t chosen a title yet. They think it’s incredibly important, but are in no hurry. You’ll be the first to know. Arriving back home from a reporting trip, I was delighted to find a FedEx package from Riverhead with my manuscript in it. To extrapolate from the previous three drafts: I seem to turn around a new draft in one month, then to wait for three months to receive it back from my editor with comments. This time, both processes might go faster: There are far fewer comments in the margins than in previous rounds. I will finally bow to the pressure of the market (letting no side, neither the artistic nor the commercial, “win”, as Ed Catmull might say). I will drop my resistance and add a concluding chapter with …. lessons. Seven months after sending off the first draft of my book and two months after receiving it back with the comments of my editor at Riverhead, after letting the ideas ripen and mature and then doing violence to my own text, even crucifying many of my darlings in the first draft, I am ready again. I’m happy with it. But of course I am again on tenterhooks, and feeling quite vulnerable, as I await the reactions of my editor. The improvement was dramatic. I am reminded again of what Khaled Hosseini, also a Riverhead author, said about writing and rewriting: the first draft is purely a frame. The book happens in the subsequent drafts. Still, I can’t help but wonder also about the law of diminishing returns: Would I be able to make such a dramatic improvement again in a third draft? Or is this where the book wants to be? Am I perhaps … done? Things are about to get really interesting: My editor at Riverhead just emailed to say that he has finished putting his comments into my book manuscript and will send me (the old-fashioned way, this being the book industry) the pages next week. That’s when I begin my favorite part of writing: the re-writing. Research, whether for The Economist or my book, can be a hard slog, and filled with anxiety. The first draft is then a way of cleansing the anxiety by letting it out and giving it shape. But beauty happens in the re-writing, as Khaled Hosseini (also with Riverhead) said so well. 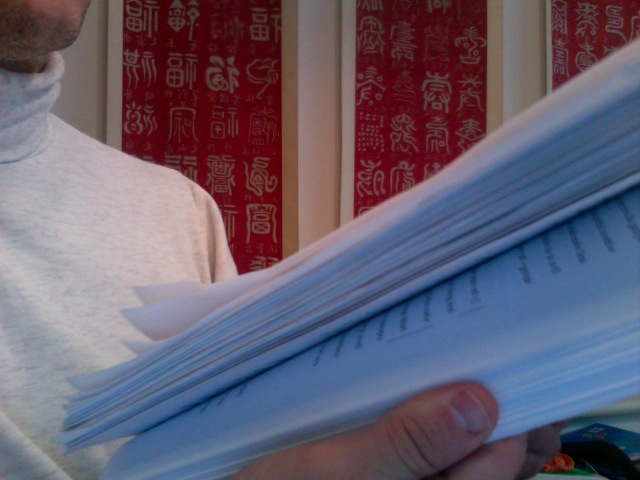 I sent off the manuscript a few months ago, and have since (deliberately) not even looked at it. In my mind and memory, the text has settled. Parts have receded, parts have become amplified. When I look at it fresh next week, things will jump out that I was blind to in February. When I talked to my editor a couple of weeks ago, he sounded very happy with the book. My agent is happy too. That’s a good reaction, if it is half of the reaction. The other half must be the assumption that it can be made even better. That’s what I’m going to do in the coming weeks. Then, after I send it back to Riverhead again, we will find the best title, and the date of publication. My agent called me a while ago to say, to my great delight, that he had re-read my manuscript over the weekend and loved it even more than the first time. Also to my delight, he said that my publisher, Riverhead, is doing fantastic (even in this economy). And then–this made me laugh–he said that the reason they haven’t got around to processing my manuscript yet may be that I’ve done something unheard of, something shocking. Apparently, in the entire history of book publishing, going back to Sumer, if not earlier, no author has ever handed in a manuscript on time. I, however, delivered my manuscript several months before the contractual deadline. The entire management of my publishing house, we are speculating, is temporarily stunned, incapacitated, by the cognitive dissonance. That is how, according to Michael Meyer in the New York Times, authors talk about their advances. Thankfully, I already know my advance, which was negotiated when I got my book deal with Riverhead, and have the first installment. But it’s always fascinating to get a peek into the world of other people’s advances. Meyer says that 7 out of 10 books do not earn back their advance. That sounds familiar. I have compared publishers to venture capitalists on Sand Hill Road, who back ten start-ups, expect to break even on two, and make their killing on one. As an aspiring author, I never cared about the advance for its own sake, but I did want it as high as possible to make the publisher “bleed” early on so that they would feel more compelled during the launch to spend even more in order to make it back. most publishers I talked to cited $30,000 as a rough average. In standard contracts, the author receives half up front, a quarter on acceptance of the manuscript and a quarter on publication, though that model is changing, said the literary agent Eric Simonoff … “Now we see advance amounts being paid in thirds, fourths and even fifths.